SATB/piano. Three beautiful and lesser-known Christmas gospel songs. The second, with its infectious island rhythm, is a particular change from the expected in a program of Christmas or holiday music. The second song, "Sistah Mary," contains a soprano solo. SATB/piano. Four poems of Robert Burns. Burns, the folk poet and lover, is captured in these settings which are full of exuberance and love of life. SATB/keyboard. Setting of miscellaneous texts. An upbeat and joyous anthem. SATB/keyboard. A setting of the Elegy in Thomas Wolfe's novel, Look Homeward, Angel. The sensitive, flowing setting captures Wolfe's many word-pictures. Inspired by the touching beauty of the poetic words: "Oh lost and by the wind-grieved ghost come back again as first I knew you…"
SATB/keyboard. 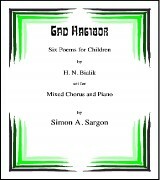 Six settings of poems for children by the Israeli poet, H. N. Bialik. 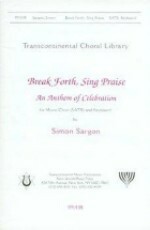 Originally written for solo voice while the composer was living in Israel and later revised for chorus. The child-like charm of the words captivated the composer and although the cycle is meant to be sung by adults, it will appeal to audiences of all ages. SATB/piano. 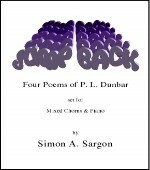 Four texts of the poet Paul Laurence Dunbar, one of the greatest African-American poets this country has produced. The songs run the range from his intentionally humorous poetry in dialect to his serious contemplation of creativity and death. Text of William Byrd set for SSA-TTB/piano. The observations of the 16th century English composer, William Byrd, are as meaningful today as when he first penned them. The benefits of singing-- particularly in a group-- are immeasurable and it is most appropriate to proclaim God's praises with the singing voice. In a madrigal/Renaissance style. Fun to sing, a challenge for choristers and a joy for the audience. SATB/piano. 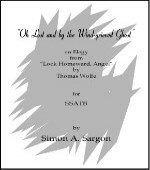 "The beauty of this setting of Psalm 1’s English translation won’t surprise anyone familiar with Sargon’s gift for flowing textures and dynamic development. This piece feels at home in a service of any faith." SATB/keyboard. 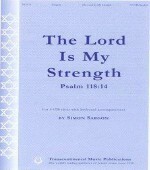 A driving and energetic setting of the Psalm text in which the repeated rhythmic patterns build to an exciting climax. SATB/keyboard. 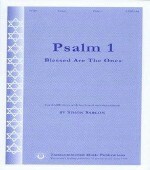 "Another piece from Transcontinental Music's 2008 Composer of the Year, this beautiful setting of Psalm 118 is a wonderful component to any worship service – Jewish or otherwise. This piece conveys feelings of purity and comfort."